When enlightenment ideas spread to France, the idea would spread quickly and become amazingly popular at all levels of society. Since France was the country with the strongest of the Absolute Monarchies, the people would quickly invite any ideas of spreading the power out to the people. 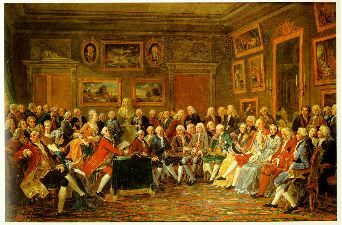 The French people would develop debate clubs (called salons) that were often very informal but would allow for highly intellectual debate over the latest enlightenment concepts. France quickly became a HUGE market for enlightenment ideas because it was among the most literate societies in the world at that time. decisions of the world, but instead set the world on a sort of autopilot. To deists, the most logical way to proceed would be to learn the system so that it can be manipulated to the advantage of the people when needed. While this may seem strange to us now, it was a quite popular belief at that time period. In fact, many of this countries founding fathers professed belief in this at one time or another; although stating definitively how many, or who was involved, is hotly debated to this day. Among the most well-known French philosophers was the Baron de Montesquieu (1689-1755), who would add to the works of Locke during his life. Montesquieu was most well known for his book Spirit of Laws (1748) in which he explains the concept of separation of powers in more detail. He believed that this was an important addition to any system, since it gave the country a system of ‘checks and balances’ to protect against tyranny. This theory would also be added to the U.S. constitution a few decades later as our founding fathers openly referenced their admiration for his ideas. He was not, however, a huge proponent of any particular type of system over another, and would often state that no single form of government worked in all situations. So his beliefs were that systems would have to be modified slightly to fit the situation in order to have the greatest impact. François-Marie Arouet (1694-1778) is by far the most well-known of the French thinkers of the era, although he is better remembered for his pen name of “Voltaire.” He was among the more controversial thinkers of the enlightenment due to his strong belief in reason over what he believed was a culture of superstition and intolerance. His harsh criticism of anyone who held beliefs he disagreed with would cause him to be expelled from numerous countries during his life, and would nearly die when he attempted to “out” Frederick the Great of Prussia as a homosexual. Thankfully, for him, Frederick was a great admirer of his work, so he was allowed to simply leave the country for this perceived insult (which was likely true). One important concept to remember is that the mere ideas that were being developed during this time were HIGHLY controversial, and espousing these beliefs in public could lead to arrest or worse. The Catholic Church had just ended an era of public executions for anyone who had beliefs that differed from the official church teachings (heretics). So when Denis Diderot (1713-1784) attempted to catalogue all knowledge of the era into his Encyclopédie he was actually taking a huge risk. Over the course of 25 years Diderot would attempt to collect all human knowledge into what would become a 28 volume set encyclopedias that would require the help of many of the major writers of the era. While we don’t currently think of encyclopedias and ground breaking today, the idea of gathering all knowledge and placing it into a single set of books was highly controversial for the time period. His work was seen as an attack on religious beliefs because it described scientific beliefs that had not yet been accepted into official church doctrine, so it had to be done in semi-secrecy for much of this time. This encyclopedia would be historically important, not only for spreading enlightenment ideas around Europe, but also by increasing the literacy of the continent as people tried to read it.